Dr. Alok D Sharan, MD is a Doctor primarily located in Bronx, NY, with another office in Yonkers, NY. He has 19 years of experience. His specialties include Orthopaedic Surgery and Orthopaedic Surgery of the Spine. He speaks English. The overall average patient rating of Dr. Alok D Sharan is Good. Dr. Alok D Sharan has been rated by 25 patients. From those 25 patients 10 of those left a comment along with their rating. The overall rating for Dr. Alok D Sharan is 3.3 of 5.0 stars. My name is iris. I just had surgery with Dr. Sharan on November 1. I was so scared when I got to the hospital. The staff n dr sharan made me feel relax. Thank you Dr. Sharan n ur amazing staff. I’m very happy I did the surgery. I had a complex condition in my spine. Dr. Sharan and his team were able to carefully remove a complex tumor in my spine. I am very grateful for this efforts. follow up after visit was the Worst!!! He did nothing for my mother and sent her home in excruciating pain. she had to go to the emergency room the very next day. he also told my mother to seek pain mgmt with doctor blanco but never left the referral in the chart. i called 6 times in 3 days and he never returned the call! thanks for nothing. You can be as nice as you want but i'd rather have a mean doctor that actually does work efficiently!!! I will make sure i complete a rating on every site possible! Dr. Sharan obtained his undergraduate degree at Boston University where he was part of the seven-year accelerated BA/MD program. He went on to receive his medical degree at the University of Medicine and Dentistry of New Jersey. He completed his orthopedic training at Albany Medical Center and then specialized in spine surgery at NYU Hospital for Joint Diseases. While at NYU Hospital for Joint Diseases, Dr. Sharan was named an AO Spine Fellow and was also selected to be an AAOS Washington Health Policy Fellow. Dr. Sharan subsequently joined Montefiore as the Chief of the Orthopaedic Spine Service. He has focused his practice on minimally invasive spine surgery, treating patients with spine tumors and complex deformities. He is interested in understanding healthcare policy and committed to providing the local community with the highest quality of spine surgery care. Take a minute to learn about Dr. Alok D Sharan, MD - Orthopaedic Surgery of the Spine in Bronx, NY, in this video. Dr. Alok D Sharan is similar to the following 4 Doctors near Bronx, NY. 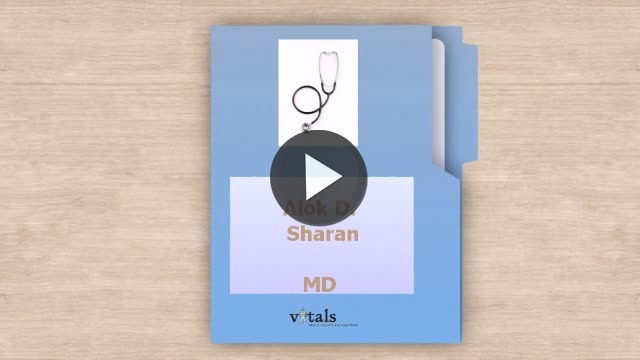 Have you had a recent visit with Dr. Alok D Sharan? Select a star to let us know how it was.